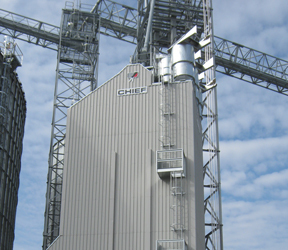 Almost a year ago, GROWMARK’s Total Grain Marketing (TGM) location at Neoga, Illinois completed installation of a groundbreaking mixed airflow grain dryer. with the help of Chief Industries, United Kingdom. Now, GROWMARK Commercial Grain Systems Project Manager Paul Brooks says they are working on constructing another one in Kearney, Nebraska where it will be used for drying organic grains such as blue corn tortilla chips for food consumption.